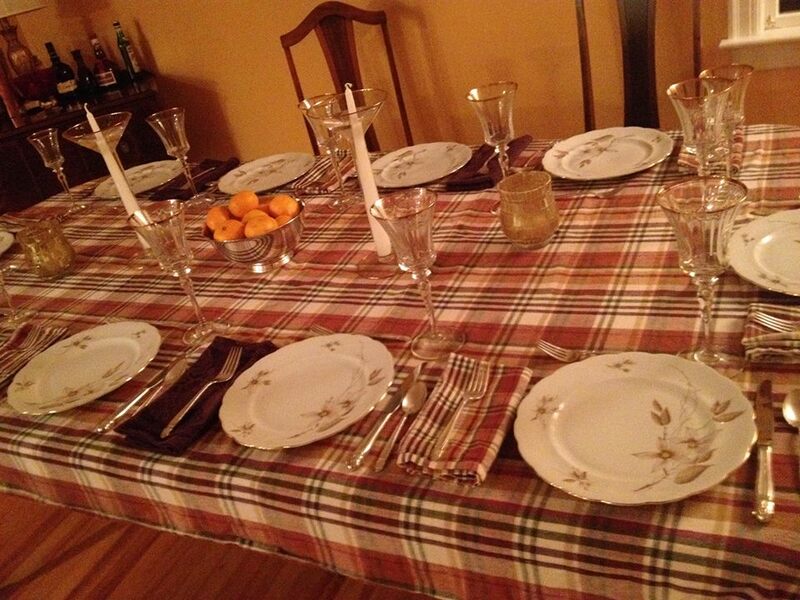 That’s my Thanksgiving table 2013, above, complete with my late mother-in-law’s silver and china. I inherited my mother’s belief that holidays and special occasions should be as festive as possible, with all the trimmings (and suspension of the regular austerity rules). That meant, among other things, the best china, linens, crystal and silver were used. Silver was polished the day before. Linens were ironed the morning of. And then there is the main attraction: The food. SueG would not support the current mania for over thinking Thanksgiving. As she used to say (and I agree), what could be easier than sticking a turkey in the oven, adding some root vegetables and a green veggie of some sort and serving it a few hours later? People love to do totally unnecessary fancy things to turkey (I’m looking at you, brining) because then they feel particularly entitled to their dinner. This was not the case with SueG, who believed in making an effort when it was time, but did not believe in doing things that would not affect the taste in a positive way. SueG was an authority on turkey. She instinctively knew how to roast a turkey to perfection, using a perfectly regular turkey (frozen or fresh) from the grocery store and an ordinary oven – no 24-hour brining, spatchcocking or deep-frying for her. I am solidly in her camp. She believed one needs a gravy “gene” in order to make good gravy, and that my sister and I were in possession of same. Her stuffing is simple and decadent in its reliance on butter. It tastes delicious. Without further ado, SueG’s principles on turkey. First concept: The modern turkeys we buy at the grocery store are injected with lots of water, for a variety of reasons (including bumping up the price). As such, despite the universal belief to the contrary, it is very difficult to dry out a turkey – or, phrased more positively – it is quite easy to cook a moist and delicious turkey. Unless you are buying a fresh, homegrown (or, God forbid, live) turkey from Martha Stewart’s farm or the equivalent, there is simply no reason at all to either baste or inject or brine. You can do these things if you are experimental and have lots of extra time on your hands. SueG was highly experimental, but not when it came to Thanksgiving, a day on which she most definitely did not have extra time, and neither do I. So the first guiding principle: Be confident, and your turkey will not be dry. A third guiding turkey principle– my addition. I have discovered (due to my always being late to put the turkey in the oven on the big day) that one can roast the turkey at a fairly high temperature, even 375 degrees – GASP – for an hour or two to speed things along and you will still not dry it out. Really. Try my technique this year. I start out my large turkey (at least 18 pounds) on 375 topped by a folded tinfoil hat for two or three hours, then I turn the heat down to 325 or 350 for the rest of the time. No one has died (other than our turkey friend) and the turkey is not dry as a result. A great time-saving device of which I believe SueG would have approved heartily, prizing efficiency almost above all as she did. Fourth guiding principle: If you buy your bird frozen, plan on a lot of defrosting time (i.e., at least a full day sitting on the counter or as much as a week in the fridge followed by 12 hours on the counter). If you buy it fresh, plan to sit the bird on the counter for at least 12 hours prior to cooking as fresh ones seem to need quite a bit of warming up, too. Fifth guiding principle: Absolutely stuff the bird (see recipe below), This nonsense about stuffing the bird itself being somehow dangerous does not deserve another thought. Remove the plastic. Remove the packages with the neck and internal organs from the turkey’s cavity and discard. (We used to cook the liver in tinfoil for our cats and dog.) Rinse off the turkey, pat dry with paper towels. Arrange the turkey in your roasting pan (we like one with a rack that keeps the turkey from sitting in its grease while roasting). Stuff both the fore and aft cavities (more on that below). Tie the legs together for minimum stuffing escape. Generously season the turkey with salt and pepper on all sides. Top with a tent of folded tinfoil and set into your preheated oven (see note above). There are instructions, very easily obtained, regarding how long to cook a turkey of particular weight. I don’t follow those because I roast at a much higher temperature for the beginning part. We use the pop-up indicator as a sign the turkey is done, along with the jiggling the leg (looseness indicates doneness). We have been known to use a meat thermometer though you know for sure SueG did not. When the turkey is done, take it out. Lift the rack containing the turkey out of the pan, which will have a nice accumulation of drippings you will use to make the gravy. Cover the turkey with a sheet of tinfoil and then stick an old coat on it (really!) and let it rest on a platter until you’re ready to scoop out the stuffing and carve the meat. Our resting period tends to be about an hour. As noted, you should have lots and lots of yummy drippings from the turkey in the bottom of the pan, along with a lot of grease and water. Scrape/spoon all of it into a large measuring cup (or any glass cup you can see through). Spoon off or pour off as much of the straight grease as you can (it should be easy as this will be on the top). Return the rest of the yummy drippings, including browned bits and juices, to the pan in which you roasted the turkey. Put it on the the burner over med heat. Add a few tablespoons of flour. (If you have a HUGE turkey, maybe a half cup.) Use a wire whisk and cook the flour and drippings for a minute over med heat. (If you do this step right there will be no flour lumps.) Then pour in 2-3 cups of water (it will thicken) and season liberally with salt and pepper. Cook and stir it bubbling for a few minutes. (SueG’s saying: “What’s the difference between gravy and grease water? 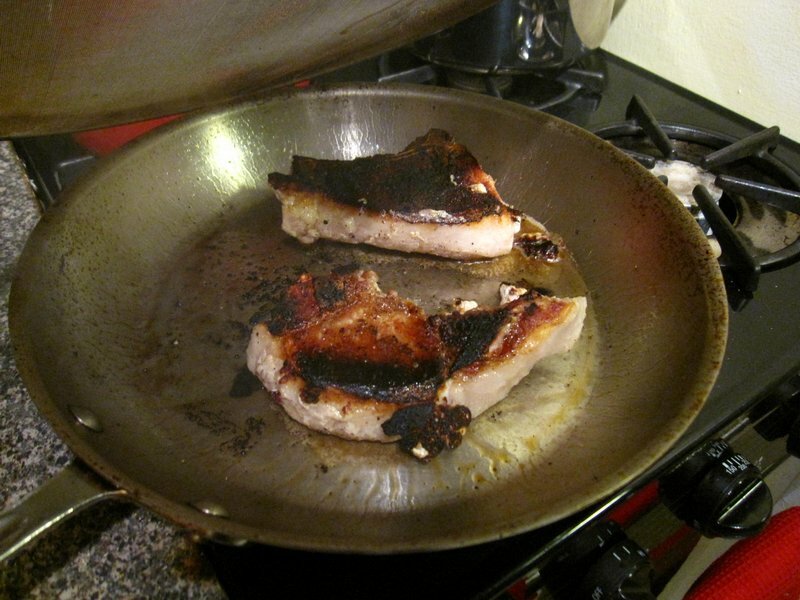 SALT.”) After a few minutes, you should have smooth, beautifully golden brown gravy. If there are chunky bits that you don’t like simply spoon them out. Do this right before you’re about to sit down. Serve in old-fashioned gravy boat. (I use one without foil trim as that cannot go in the microwave.) Gloat over possessing a gravy gene. This is one of the most basic stuffing recipes imaginable but we love it so much I have never been moved to try something more adventurous. This is basically the recipe on the back of the Bell’s seasoning box. 1. The day before Thanksgiving, lay out an entire large loaf of Pepperidge Farm white bread, one slice deep, on cookie sheets to dry out. NEVER, EVER use bagged stuffing crumbs. Just NO. You may need to turn the slices over at some point to ensure the bread dries out evenly. In a pinch, I have discovered, you can toast the bread very briefly in the oven (you don’t want it to get brown, just dry). On Thursday, cut up the dried bread into medium-sized squares (not those tiny breadcrumbs you would buy. Absolute no-no of mine and SueG’s). 2. On the day of, chop equal amounts of onion and celery fairly finely. Get one or two frying pans going. I use one stick of butter per frying pan (I know), and between the two pans I guess that would be about 4-5 onions’ worth and lots of celery. (SueG’s quantities were never exact, and mine aren’t either.) Two frying pans’ worth will go into a large turkey of 18 pounds or so. Cook up the celery-onion mix in copious amounts of butter. Do not add salt at this point if you are using salted butter. 3. Put your dried bread cubes into a large bowl (I use a really huge one). Dump the cooked onion-celery mix (should be dripping with melted butter) along with any extra melted butter onto the bread. Add tons and tons of Bell’s seasoning. (You can’t overdo it. Do not be shy.) Toss the bowl’s contents with clean hands or two spoons to blend. Taste some. Now is the time to tweak the seasoning. It should taste good! You will almost certainly need a lot of black pepper, and you may need some salt. Make sure you taste. The rest of the Thanksgiving meal will follow. Don’t forget the turkey tetrazzini! Absolutely — and will have a recipe for that next week!